Located in the heart of bustling Kelham Island, Dun Works is a great location for urban living and working and walking is one of best ways to get to wherever you need to be. Whether you're already familiar with the area or a new settler, to help people find the best walking routes, we'll keep on the right path. Fact of the day: Burning 500-1000 calories per week (that’s about 6-12 miles walking for an average weight person) reduces the risk of premature death by 20-30%. What about the health and cost benefits of walking? A comprehensive report Walking Works, published by the Ramblers, the charity for walkers and Macmillan Cancer in October 2013, outlines how in England 61% of adults and 30% of children between two and 15-years-old are classed as overweight or obese. The report provides details about the impact of associated health problems of this inactivity, which are costing the economy up to £10 billion a year. You can read the report in full by clicking here. The Walkit.com website provides a number walking route maps of the local area which provide estimated journey times and distance covered on foot, as illustrated in the example map below (Point A is the starting point from Dun Works in Kelham Island, point B indicates the destination point at Sheffield Interchange Bus Station, journey time travelling at medium pace is 19 minutes, distance is 0.9miles, 1.4km). Click the map to view on the Walkit.com website. For more walking maps of the area, check out Walkit.com (type 'Sheffield' in the search box). Road safety for kids is vastly improving. Child pedestrian injury rates are down significantly since 1995 -- mostly because of increased education to parents and better traffic infrastructure surrounding schools, such as pavements and lollypop ladies/men. Tip 1: It's a good idea to evaluate the distance to the school, the availability of pavements and street lights, the type of area (do people look out for one another? ), whether the roads are busy and the local street safety measures. Tip 2: What is your child's maturity level? Consider your child’s ability to follow directions, be sensible and be streetwise. Do they know who and when to ask for help? Are they savvy about stranger danger? Tip 3: YouGov reports that the average age at which Britons say that a child is fine to walk to school unaccompanied by an adult is 10 - however it almost goes without saying that not all 10-year-olds are the same! So parents are advised to use their own judgement when it comes to thinking about the maturity level of their own children. Before your child heads off on their walk to school by themselves (or with friends), there are a few safety precautions you should take. Never let a child under age 10 cross the road alone. Traffic signals and pavement markings have done wonders to improve road safety for kids. Make sure your child can reconise and obey them all. Choose the safest route between home and school and practice walking it with your child until they can demonstrate traffic-safety awareness. Stick to well-travelled streets, use the same route every day and avoid shortcuts through wooded areas, car parks or alleyways. Put their purse or wallet in an inside coat or front trouser pocket, not a back pocket. Don't wear movement restricting shoes or clothing. Cross streets only at safe points i.e. at zebra crossings; never enter streets from between parked cars or from behind shrubbery. Walk -- don't run -- across crossings, and only when the man is green. Switch direction or cross the street if they think someone is following them or if they feel unsafe. Walk towards an open shop, restaurant or yell for help. Be aware of strangers. If a stranger approaches, tell a teacher, the head teacher or another trusted adult. For more advice about safe walking for children, visit this page on the Care.com website. The Walk.it.com website provides walking route maps which include detailed walking routes from Dun Works to the closest schools in the area, such as the example map below which details Point A (Dun Works) to Point B (Netherthorpe Primary School) with pedestrian crossing displayed at step 3 to cross Shalesmoor). Another good source of information to find out what's on in Kelham Island and the rest of Sheffield city centre is the Welcome to Sheffield website, which you can search for a variety of events and places to visit, as well as food and drink venues and other things to see and do. Walking has a complete section of its own which links from the Visit pages on the Welcome to Sheffield website to Sheffield The Outdoor City. The section about walks in and around Sheffield can be viewed by clicking on this link. Why not take a stroll in the city on the Norfolk Heritage Trail which features sights from the medieval to the modern? Click here to get a PDF of the route to follow or click on the map below. At Dun Works there's little need for using a car to stay on the move either, because getting around by bike is easy and speedy too. We've given some pointers below to get you (and your bike) pumped up for peddling. Cycling is good for our health, good for getting us around and good for our environment. For all of these reasons we will all be better off if we cycle more often. What about the health and cost benefits of cycling? A number of scientific studies from across the world, which assess the benefits of active travel, including specifically cycling, in economic terms have been published and are available to view on the Sustran website. To check out this information, click here. As the whole of the city centre is within a 2km cycle ride of Dun Works, the potential upper end cycle time across the city centre could be less than 10 minutes. Sheffield also has designated cycle lanes in and surrounding the city centre. Some cycles routes cross pedestrian areas, always give way to pedestrians in these areas. Look out for the signposted routes. Sheffield is renowned for its scenic hills. Be prepared for some steep climbs! Bicycles with gears are recommended and ensure your bicycle has brakes fitted. Try to avoid roads tram tracks and take extreme caution when riding near or crossing a tram track. Bicycle wheels can get caught in the tracks grooves and tracks are slippery particularly when wet. A range of cycling route maps for Sheffield are available which cover the following areas: Sheffield North (Crookes and Darnall all the way up to Stocksbridge), South Sheffield (from Hillsborough and Fir Vale down to Totley and Halfway, also Includes the city centre), North and South (the complete cycle map from north to south with text and photos as seen on the printed version) and Sheffield City Centre (City Centre). To view the full list of maps on the Sheffield City Council website click here. The cycling route map below is for Sheffield City Centre. Just click on the image to view the map in greater detail. For a cycling route map which covers the entire north and south of Sheffield click here. Bike Libraries are a location or mobile unit with a fleet of bikes which are available to loan to children and families. To find out more about bike libraries visit bikelibraries.yorkshire.com. If cycling or walking isn't enough to keep you moving, you can also take advantage of the wide range of public transports and links which are close to Dun Works. Read on to check out the options. What about the health and cost benefits of using public transport instead of private cars? Many of these short journeys can easily be made on public transport – or on foot or by bike - making a surprising difference to your carbon footprint. Plus, the journeys will usually take no more time than driving – or even be quicker. (source: Sustran). To read more about the health and cost benefits of using public transport instead of private cars, check out this Sustran website page. There is a variety of public transport services within easy reach of Dun Works to help you travel in, around and beyond the city. The nearest eastbound bus stop is Shalesmoor/Mathew Street approximately 40m from Dun Works. The bus stop is located on Shalesmoor. The bus stop provides access to bus service routes 35, 57, 61, 62,81, 82, 85 and 86. The nearest westbound stop is located on Shalesmoor approximately 200m from Dun Works and has access to the same bus services. Shalesmoor tram stop is approximately 150m from Dun Works. It is located across Shalesmoor roundabout. To help you get around the city to and from Dun Works, Travel South Yorkshire provide a range of city bus route maps and tram route maps. To access these maps, you can visit the Travel South Yorkshire website to download the maps - here is the page with this information. The city-wide map for both bus and tram routes is displayed below - just click on the image to view in more detail. Sheffield Supertram operates a Yellow, Blue and Purple line. The Yellow and Blue lines both stop at Shalesmoor tram stop and give access to the destinations including University of Sheffield, City Hall, Ponds Forge, Valley Centretainment, Meadowhall, Sheffield College, Hillsborough Park, Hillsborough Interchange, Middlewood and Crystal Peaks. Please see the map below to see where the nearest tram stops are from Dun Works. As well as a range of maps, the Travel South Yorkshire website also provides live departure information service, called 'Your Next Bus' for travellers using their bus services, who wish to find the next bus times from wherever they are, from their computer or internet-enabled devices. To access this information, just click here. For a full range of information (including timetables) about public transport visit: www.travelsouthyorkshire.com. Car sharing is when two or more people share a car and travel together. It allows people to benefit from the convenience of the car, whilst alleviating the associated problems of congestion and pollution. When can I share a car? You can share a car for any journey - getting to work, doing the weekly shop, going to the match at the weekend, travelling to a festival, event or show, getting to or from university, visiting friends or getting to the airport. What about the cost and social benefits of car sharing for commuting as well as one-off journeys? Traffic jams cost the UK economy £5 billion every year in lost productivity; but if half of UK motorists received a lift one day a week, congestion and pollution would be reduced by 10% and traffic jams by 20%. The average car-sharer saves £1,000 a year through journey sharing. It has been estimated that the lives of between 40,000 to 50,000 people in the UK are ended prematurely every year because of the air we breathe. Businesses can play a part in improving poor air quality by reducing the number of vehicles travelling to their workplace. • Saves you money – travelling with others enables you to reduce your transport costs by up to £900 a year. • Reduces the number of cars on the roads – resulting in less congestion, less pollution and fewer parking problems. • Gives employees and employers more transport options. • Reduces the need for a private car. This Travel Plan is available to provide information for residents of Dun Works. We are committed to the monitoring and management of this Travel Plan and to make any amendments and improvements, as and when necessary. Our aim is help you find the best ways to get where ever you need to be. To ensure we are supporting you - as our residents - we have recently conducted a travel survey. 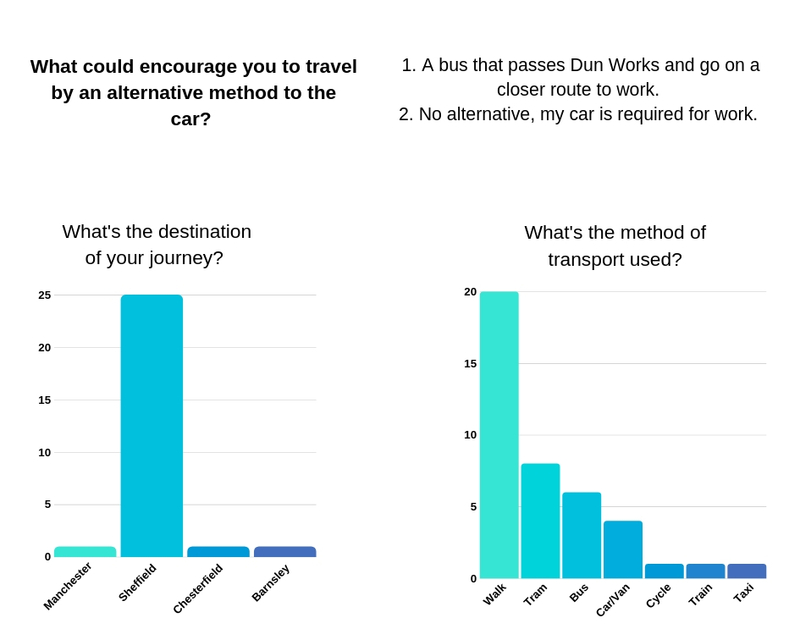 We spoke to 28 residents about their preferred method of transport, their main journey from home and what would encourage our residents to use public transport rather than a car.